Last years drive to Starved Rock was so much fun we are doing it again!! Meet at Bill Jacobs MINI on Saturday November 19th at 9:30am for coffee and donuts. We will leave for Starved Rock at about 10:00. Plans include stopping for lunch at the Starved Rock Bar/Grill. We have had a few members express interest in our Vendor Liason and Events Coordinator positions. We will be having a general membership vote for these positions, and the poeple with the most votes will win! Please read the Bio's below, and send in your favorite choices for the two positions to Steve Rosenblum by Sunday November 6th, 2005. One vote for each position per active Club membership. If your membership has lapsed, you still have plenty of time to send in your Membership Renewal before voting closes. The BIll Jacobs MINI Halloween Party! Please join us at Bill Jacobs MINI in Naperville for our Wicked MINI Halloween Party. Bring your MINI “in costume” and you might win a “Wicked Night on the Town.” We'll award prizes for the “Best Dressed MINI”, and the “Best Dressed MINI Owner,” two separate winners. You can download the entire invite here. Huge thanks to Pat for all the time and thought spent organizing this drive, as well as the rally questions. Huge thanks to Knauz MINI as well for supplying the award for the winner. The Fall Rally for the Chicago MINI Motoring Club saw spectacular fall weather. After gathering at the Libertyville train station, 25 MINIs and one original Mini Cooper were ready to rock. We held a quick drivers? meeting while the rally directions and questions were distributed. 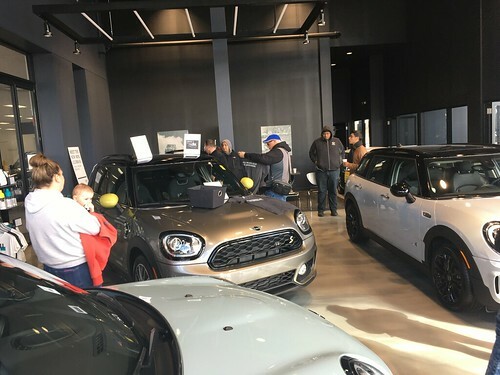 Thanks to Knauz MINI of Lake Bluff, the Club had a terrific prize for the winner of the Rally: a radio-controlled MINI! As Gabe said, ? ?and it?s valued at $110!? We headed out and towards the center of the county just before 10 am. The first navigational trick (that is, turning into the University of St. Mary?s) proved to be a bit difficult for some on this bright Sunday morning. But no matter, after a bit of quick motoring through the town of Mundelein, all MINIs were back on track. After we drove through the seminary, we congregated in a nearby subdivision before heading out for the rural roads. Folks in the neighborhood were so amused by the site of 26 MINIs on their street that some grabbed their cameras and squeezed off a few shots before we rocketed west. Our parade wound through the north edge of Wauconda and through Volo before stopping for a break at Singing Hills Forest Preserve. Not surprisingly, every car that left Libertyville was back with us! Lines quickly formed to use the ?facilities? while Rich and Steve tried to race their scale model MINIs. Too bad they shared the same radio frequency or we may have been treated to some NASCAR-style driving. The MINI pageant was not here for long. With the road beckoning, the drivers teased their gearboxes and roared out onto Fish Lake Road. Most cars had their tops down or windows open while they ripped up the roads. Bright orange maples and golden oaks lined parts of our route and showed off their fall brilliance. The drivers navigated south on Fairfield Road and then the last few miles through the Chevy Chase area before turning north and then sprinting east towards Austin?s Bar and Grill.The drivers navigated south on Fairfield Road and then the last few miles through the Chevy Chase area before turning north and then sprinting east towards Austin?s Bar and Grill. Gathering inside for food and drink, we told lies about our driving skills as well as who did the best job of rallying. Those brave few who tried to keep up with the rally questions gathered together to score their answers. Out of 34 possible correct answers, Kirsten won the radio-controlled MINI with an impressive score of 26! Thanks to all who came out on a fine autumn Sunday for a great morning of motoring! Keep watching this site for details of the Club?s next event.